Dyeing instead of hooking today. I was unhappy with my third attempt to hook a background on my grasshopper rug when I realized I shouldn't be hooking a background. I wanted to have sky around the rider and top of the horse, so it made sense to have sky above the tennis players, too - and then I realized I should have sky all the way across the top (I'll do some kind of ground/grass/wildflower for the bottom portion) so I needed to dye some wool for the sky. I had some sky blue, but it's in a very heavy wool and I hooked it already around my horse and rider and I'm not really pleased with it, so I decided to do some bleeding. I chose a piece of dark royal blue, about a 3"x 18" strip, and selected some white wool - without measuring, I think I may have picked up about half a yard, and tore it into a few pieces. I simmered them all together with some dishwasher surfactant and some dish soap (I didn't have any powdered Tide, which I prefer.) 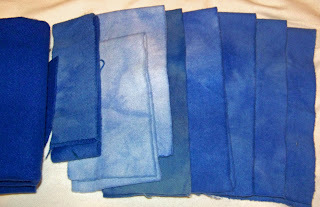 I simmered them for about half an hour, checked and found all blue wool, no more white. I poured in a large glug of vinegar, and then added a second glug just to be sure. Then I tore two more strips of white wool and added them to the mix a minute or so apart. I left the new pieces in the pot only a few minutes and then pulled them out so I would have some lighter blue for the sky. I left the wool alone in the heat for another twenty or thirty minutes, then pulled them out to cool, and rinsed them with hot water. Then they went into the clothes dryer with a towel. The photo shows the finished wool. The dark blue on the left is the source wool, the next narrow strip is what the source wool looks like now. The next two strips are the white wool I placed in the pot briefly toward the end. The next five pieces were in the pot the whole time. I have no explanation for the grayer looking piece next to the light wool, but the random results from bleeding wool are the things that make it fun. After pouring in the vinegar and letting the wool set for about fifteen minutes, I started bailing some of the dye water out of the pot. 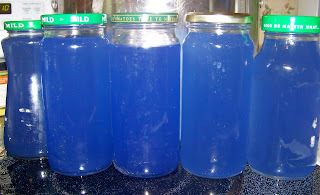 I saved it in jars, so I will have acid dyes ready to go if I need to make more sky wool. While the blue wool was in the dryer, I started working with some mushrooms. The mushrooms in the photos are two that were in our backyard. I gathered them this morning when I was concerned that the dogs were playing too close to them. I haven't identified them, my good mushroom books are at the farm and not here, but I'm thinking there's a good chance they're in the Amanita family and are poisonous. 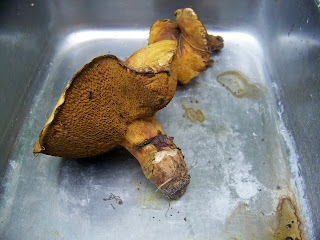 I didn't want the dogs to lick them or break them up and get the spores, etc. on their feet, etc. I put them in a stainless steel pan and added some water to the pan. Adding the water was a little iffy - without thinking, I took them into the kitchen and then suddenly remembered that they could be killers... so I was very careful with them from that point on. They are now soaking in water. I should have shredded them, according to the books, to release dye color, but I didn't have the heart to shred things so beautiful - so I'm soaking them whole. The water immediately had a very slight yellow tinge, so maybe color can be obtained without destroying them. 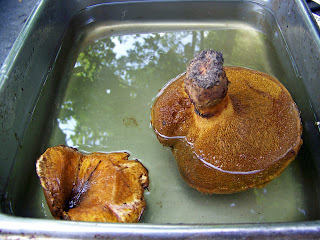 I am always afraid of mushrooms around the dogs but they don't seem to even look at fungus'. Your dying looks great..lovely blue!